Ryan is a senior at Unity College pursuing degrees in Wildlife Biology and Environmental Writing and Media Studies. 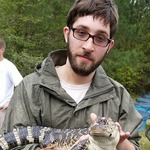 He has field experience working with a variety of mammals, reptiles, and amphibians. For instance, Ryan has conducted volunteer work rescuing cold-stunned sea turtles on Cape Cod and collected biological data from harvested moose at check stations in Maine. Ryan also has experience in digital media production, photography, and science communication. Currently, Ryan is working in the field as a Research Assistant Intern and is our lead web designer and digital media specialist.